The Appomattox Court House Loop centers on the historic Appomattox Court House where the Civil War officially ended and a stronger nation was born. 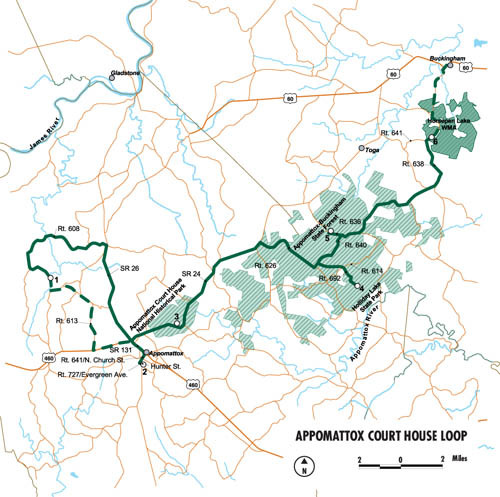 This loop winds its way through the gambit of habitats to be found in the Virginia Piedmont from young pine plantations to wooded ponds and rolling fields. Careful inspection should yield a number of welcomed surprises: perhaps a group of wild turkeys squabbling through the underbrush or a herd of white-tailed deer bounding away, their white-tails flashing in the sun. Even the smallest patch of woods could turn up a Blackburnian warbler, blue-headed vireo or some other jewel-like migrant in spring or autumn. Even in the heat of summer, black saddlebags and the occasional twelve-spotted skimmer can be found gliding just overhead.